Navy Veteran Joe Geoghagan needed help, and the Alabama VA failed him. For reasons I won’t detail here, I will now admit that I failed him as well — and I feel horrible. Hopefully, by telling his story it will slightly ease the pain of a man who has already suffered far too much, and perhaps shed some light on just how woefully deficient we as a nation are in taking care of the men and women who risk it all so that we might live in a safer world. Joe enlisted in the Navy in 2003 and was honorably discharged almost five years later. During that time he deployed two times to Afghanistan and once to Iraq. When he returned home he started suffering symptoms of Post Traumatic Stress Disorder and Depression, which was followed years later by perpetual nausea. The Alabama VA couldn’t figure out what was going on with Joe, so it came up with a solution: Cut hole in his stomach, stick a tube in him, give him some Boost shakes five times a day and hope for the best. Then, not long afterward, he got a letter in the mail saying his mysterious stomach illness was not the result of his military service and that he would be having a portion of his benefits cut. Why does it not surprise me that the same U.S. Department of Veterans Affairs that denied 80 percent of disability claims filed by Gulf War veterans (citing “inadequate and insufficient evidence” to indicate that the cancers, chronic fatigue and migraines they suffer from are service-related) would pull that same sort of stunt with Mr. Geoghagan? Luckily, local media outlets and Sen. Jeff Sessions put pressure on the Birmingham VA Medical Center and Joe was admitted back into the hospital for further testing on Monday, July 14. 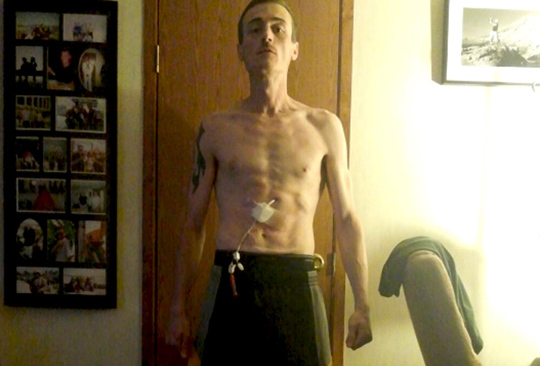 Joe had to endure seven long months of constant vomiting, a drop in weight from 267 pounds to 130 pounds, and unspeakable mental and physical distress — but at least he’s one step closer to finding out what’s wrong with him. The funny thing is, after Sen. Sessions’ office began looking into the matter, the VA temporarily granted Joe total disability. He will now receive $2,859 a month to cover his medical needs instead of $577. Amazing how that works, doesn’t it? If you’re looking for the VA’s side of the story, here’s what Birmingham VA Chief of Staff Dr. Bill Harper told a local station: “We have a cadre of people that are very happy, and we have a cadre of people who aren’t so happy.” He added that because the Medicare website on hospital comparison put The Birmingham VA “equal to and/or above average in three areas — treatment of heart attacks, pneumonia and surgical care,” it’s a clear indicator that the quality of care veterans are receiving is sufficient. “I would put [Alabama’s VA care] up against anyone else in the country and the proof is in the pudding,” he added. Perhaps Dr. Harper should have said “the proof is in the Boost shake.” Or maybe not, since that would remind people of how Joe has been treated. Question: Is the Alabama VA a model of for veterans health care everywhere, or are they just like the VA personnel operating out of Philadelphia — cooking the books, retaliating against whistleblowers and attempting to bug congressional investigators? The committee investigators were directed to a workspace at the regional office which was outfitted with cameras and microphones. Upon discovering they were being monitored, the aides requested to be moved. The Under Secretary for Benefits apologized to the committee, clearly embarrassed. Despicable. How many “Joes” in Pennsylvania are there that we never hear about? Feeling despondent and being heavily medicated for depression, he attempted suicide last year. “Though I’m not suicidal now, I can safely tell you that the disparity and hopelessness I feel on the inside has not changed,” Geoghagan said. Although he is still determined to fight, he has made peace with the fact that he may not win this battle. No veteran should ever have to feel like he is hopelessly stranded in a a pit. No veteran should ever be placed in a situation where suicide seems like the only option capable of easing his pain. It is culturally criminal for the individuals who send men and women off to war to allow a system to exist that would foster this level of despair upon their return home. Right now I feel as though I could have made that speck of light just a bit bigger for Joe, but like I said — I failed him. Hopefully this blog post will telegraph just how much complete strangers care for his physical and mental well being. Hopefully, it will lift his spirits to know that others will read this and possibly share it with their friends, family and loved ones. If you’re able to help Joe out, there is a Go Fund Me account seeking to raise $10,000 for his medical expenses. And if you meet a veteran, make it a point to be a speck of light in their life because you may just be the only one they see. Thank you for sharing. Have you seen the story about what some Lowes employees did for a vet recently? I only saw the headline about them fixing a wheelchair because the VA wouldn’t for some reason. Sigh… That system is so screwed up. It’s a mess. They basically need to scrap it and find a way to let wounded veterans see the doctor of their choice. The VA is basically a microcosm of what will happen as the government controls more and more of the Health Care system. Joe’s story is a sad example of the system failing some. I know Joe personally. I worked with him at the job he was fired from for “not being dependable”. He wasn’t dependable because it was the beginning of his illness and he was habitual vomiting. Long before the VA failed him, L-3 Communications failed him. They dropped him when he needed his job/income and health care coverage the most. The VA system may not work for some, or most, but it works for myself and many others. Coincidentally, I too joined in 2003 and exited 5 short years later. I receive a generous tax-free monthly benefit that I couldn’t possibly live without. So, when people speak of ditching the VA for something new, I cringe. I’d be in a world of hurt without the assistance they provide myself. I also receive incredible care from my local VA and my Service Connected Disability Case Manager. That lady is a shining example of the right level of care being provided. She calls me nearly every month and talks to me about my pain, health, and well-being. She makes me feel important and not useless, and all veterans need a Case Manager like her. Thanks for taking the time to read and comment, Bryan. I appreciate it. I’m glad that the system has worked out for you and that you have a stellar case manager. Hopefully, as congressional investigations continue and reforms begin to take place, more veterans will receive the kind of care they deserve. Thank you for sharing this story. I will share it as well. I truly hope Joe is getting the care he needs right now. What a horrible ordeal! Three deployments in five years is a lot, too. Thanks for taking to read and comment, Emily. I really appreciate it. My understand is that Joe is still in the hospital and they’re going to do some more tests on him tomorrow. Great article, Douglas! Thank you for sharing Joe’s story!! Thanks for reading and taking the time to comment, Paula. I really appreciate it. Anyone adding illumination to Joe’s plight is a friend in my book. Thank you for taking the time to write this great article and further exposing the grossly underwhelming care he has received. I am hopeful that the medical attention, his health and happiness will continue to improve as the VA is held accountable for its behavior and policies. Thanks for the kind words, Christyne. Joe will definitely be in my prayers in the days and weeks and months to come. I can’t wait to see him big and strong again. Douglas, has nobody come forward to help Joe with this yet? Thanks for checking in. My understanding of the situation is that it’s been a bit of a roller coaster ride. It seems like it’s one step forward and two steps back, unfortunately. Hi, I’m an Honorably Discharged Vietnam Vet. (Nam 67-68) now staying at a V.A. facility south of Boston. * While staying here my most Precious Personal Belongings have been STOLEN and that Really Ticks me off!!! There are two locking draws available to me but repeated requests for a Key where denied!! Now my most important items, have been STOLEN! Moral of this tale? Do not bring ANYTHING You care about to the V.A.!!! And the FACT that the staff “Could Hardly Care Less” Only adds to my Frustration! Same thing is true for the Veterans Admin. Fear of Reprisals, keep me from using my name. *Editor’s note: Identifying detail of VA facility was taken out since the individual commenting is anonymous.